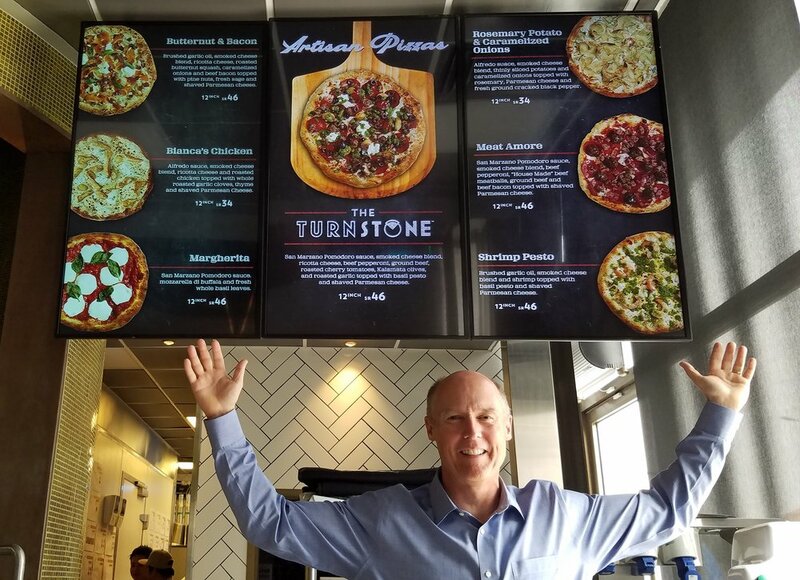 Our team has been working with PIeology to develop a differentiating menu strategy that will redefine the fast-casual pizza segment and improve the Pieology business model. One of the first products of that strategy was introduced recently nationwide. The Pieology Cauliflower Crust offers guests a new option to eat their pizza and get their veggies too! We recently helped Pieology develop their marketing technology and big data strategy. That plan, of course, included launching a mobile app. As a way to organically build their user base, we developed this fun "Pass-It-On" friend influencer program which also coincided with their introduction of a new line of lemonades. Quite simply, anyone could "gift" any of their friends a free lemonade with no purchase necessary. A nice way to start the summer of 2018. Plus, they would receive 20 bonus points in their PieLife Rewards and be entered to win free pizza for a year! Our CEO Tim Hackbardt completed a three year journey to become an Ironman on May 12th in Santa Rosa, California and raise funds for Challenged Athletes Foundation. With the continued help of many generous friends, he was able to raise $7,865 for Challenged Athletes Foundation through various race challenges over the last three years leading up to the ultimate challenge of a full Ironman race. This 140.6 mile endeavor included a 2.4 mile swim, 112 mile bike, and a 26.2 mile marathon in a single day. This funding will be used to help people with physical challenges pursue an active lifestyle through physical fitness and athletics. It will help them afford the cost of equipment such as sports wheelchairs, handcycles, mono skis and sports prosthetics, and resources for training and competition expenses. Special thanks to everyone who supported this cause over the last three years! This week, Del Taco launched a new Late Night Bites Menu that included their new Churro Dipper Shake. This shake came out of a forward looking beverage strategy development project that BrandTrip Partners performed for Del Taco. The combination of crunchy sweet and creamy sweet delivers an experience you can't find at any other quick service brand. With the help of many generous friends, our CEO Tim Hackbardt was able to raise $1,320 for Challenged Athletes Foundation with his challenge to complete the 70.3 Ironman in Austin, Texas. This funding will be used to help people with physical challenges pursue an active lifestyle through physical fitness and athletics. It will help them afford the cost of equipment such as sports wheelchairs, handcycles, mono skis and sports prosthetics, and resources for training and competition expenses. We would like to thank the following donors that will help so many have their dreams of competition in sports come true. 2017 continues to be one of the most challenging years ever for restaurant chains. Hundreds of locations have closed with more on the way. The majority of casual dining is in a seemingly never ending spiral of downward sales and lost transactions, and consumers have been fleeing multi-unit brands for locally owned favorites. BrandTrip Partners has been publishing a series of articles on turnaround strategies for restaurant chains seeking inspiration and opportunities that can change their fate for the better. The first three installments included "How To Turn Restaurants Around Part 1: Exponential Leaps Through New Revenue Channels," "How To Turn Restaurants Around Part 2: Throughput Acceleration," and "How To Turn Restaurants Around Part 3: Daypart Expansion." The fourth edition in our "How To Turn Restaurants Around" series will review historically successful examples of brand positioning by restaurant chains that were once in decline. However, before we embark on this discussion, it would seem appropriate to define the term "Positioning," assuming not all reading this chapter are marketing scholars or have watched all the episodes of Mad Men where Don Draper drops those incredibly well-distilled ad pitches on clients after getting some sort of magical inspiration during an all night Scotch and cigarette bender. 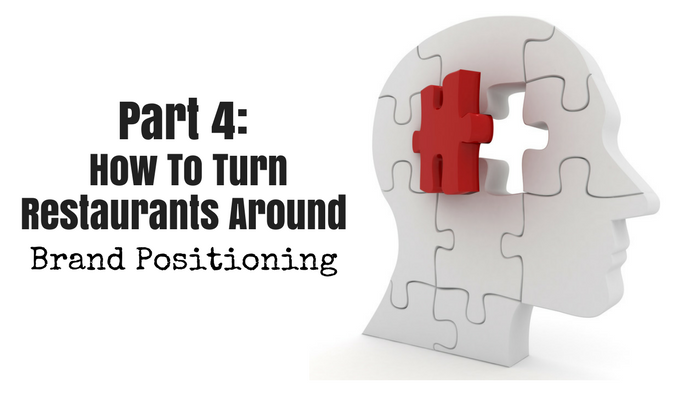 Modern day positioning owes itself to one of the best selling business books of all time called Positioning: The Battle For Your Mind by Jack Trout and Al Ries, published in 1981. However, the concept was published by Trout as early as 1969 in an article titled Industrial Marketing. In that article, he stated that positioning is a mental device used by consumers to simplify information inputs and store new information in a logical place. He said this is important because the typical consumer is overwhelmed with unwanted advertising, and has the natural tendency to discard all information that does not immediately find a comfortable (and empty) slot in their mind. If that was the case then with only a few local radio stations, just three major television networks, and generally only one local newspaper, it is certainly even truer today. There are many sarcastic endings that we could write for these positioning statements like "What Are You Eating Today? Probably Not Arby's," or "Slicing Up Freshness. Just like Subway, Jimmy Johns, Jersey Mike's, Quiznos, Firehouse Subs, and all the other sandwich places?" However, we will save you the time and get to the point. They didn't find a compelling place in the consumers' mind, and whatever menu strategy it was supporting had plummeted them to the lowest value scores in the quick-service category by 2011 as shown below. In 2014, someone with true vision was able to see the "tree" through the forest. We say "tree" because that is what you are trying to accomplish when it comes to brand positioning. You aren't selling a forest, you are selling a type of tree in the forest. The Arby's forest was filled with many species of trees, if not forests inside of the forest. Sub sandwiches, roast beef on buns, a Market Fresh sandwich line on sliced bread, sliders, and even gyros. One might say that they could play the bakery card, but when the majority of the bread comes in frozen the story gets thin and frost-bitten fast. What Arby's always did stand for was certainly roast beef. A home for carnivores. When all else failed, they could always pull out a promotion on their Beef 'n Cheddar. It would prop up sales for a time before profits eroded after discounting their signature item. It was always a short-term decision to buy time until they could find the answer that rarely came. Fast forward to 2014. Across the still valuable television screen, ever more valuable Facebook feed, and onto our mobile screens through other various social media and digital feeds came "We Have The Meats!" Four simple words, one simple message using a bold font with a slight serif on a white background after long shots of the meat and ultimately the sandwich over similar simple white backgrounds. No bite and smile footage by a group of seemingly happy millennials, no complicated storyline between two people trying to pick each other up, and no talking oven-mitt character/spokesperson. Just meat with a white background and an unapologetic voiceover celebrating that savory fact. If you like really flavorful unique cuts of meat, go to Arby's. "We Have The Meats" found that comfortable slot in the consumers' mind. Arby's has been executing this position flawlessly with strong products like Triple Thick Brown Sugar Bacon, 13 Hour Smokehouse Brisket, Smokehouse Pork Belly, and most recently Smoked Italian Porchetta. The results include 25 consecutive quarters of positive same-store sales and average unit volume growth of 25% over the past four years. In 2008, Steak 'n Shake had experienced negative same-store sales trends as high as 7.25% annually for the previous three years in every quarter. However, even more alarming were the transaction losses which were hidden behind the same-store sales reports. There were quarters where traffic declines exceeded 10% showing drastic loss of overall marketshare. Consumers were fleeing the brand en masse. For those who have never visited a Steak 'n Shake, it is a unique restaurant model, somewhat in the vein of an old-fashioned diner. When you enter, there is a host that will seat you or you can sit at a counter for an up-close and personal view of the grill. Guests are waited on by a server. The big twist is the classic Steak 'n Shake model also has a drive-thru that immediately positions them in the quick-service consideration set whether they like it or not. The obvious questions begin to come at a rapid pace at this point. Are they a casual dining restaurant? Are they a quick-service restaurant? Are they something else? How do you communicate that? In each case, is there a position that has enough scale to drive substantial revenue that isn't already being served by another major brand? The largest contributor to sales comes from their iconic Steakburgers that are made with thin patties from little pucks of ground beef smashed and seared on a grill to order until a slight crispiness is achieved. Because of the thinness of the finished patty, the burgers are not particularly large like the "Better Burger" competitors emerging at the time such as Five Guys and Smashburger. Furthermore, they were not what you would expect from a casual dining experience like Chili's, where the patty is generally 1/3 to 1/2 pound on a premium bun. Steakburgers were much more in-line with the portion size and appearance of a fast-food burger on a simple white bread bun. Their fries and shakes are their other heroes even though the menu had crept up to several pages over the years. The shakes have long been considered the quality leader on the menu with a large portion size, hand-made with a mixer, and served in-store in a tall shake glass. Drive-thru orders are slow due to the made-to-order format of the brand. If you are in a hurry, the drive-thru is not for you. However, if you had some emails to get through, or a novel to work on, the drive-thru is a great place to multitask while you wait for your order. In summary, the brand was a sit-down full-service diner with a slow drive-thru on the side that had jacked up prices beyond the perceived value of their more fast-food sized items to try and cover up massive transaction losses. Remember, this was 2008. Bankruptcies, the housing crash, and massive unemployment made it a generally overall sad time for a large number of Americans, especially in the Mid-West where the bulk of Steak 'n Shake stores were located. Dining out for a sit-down, full-service experience was getting crossed off the list as a non-essential need, causing casual dining to take a hit in sales and traffic across the category. In this darkness, came the light for Steak 'n Shake. Management took aggressive action to reposition the brand as the everyday-affordable casual dining experience by initially launching "4 Meals For Under $4." It offered almost any American hit hard by the economy an opportunity to have a quality, sit-down, casual dining experience waited on by a server at a price they could afford on a frequent basis. Steak 'n Shake provided guests dignity to be with their families around a meal again like they enjoyed before The Great Recession negatively impacted their lives. Though many would consider this a discount strategy, in reality, it was a very strategic permanent move down the positioning ladder to fill an unmet need. This long-term strategic brand positioning could be reasonably defended. TGI-Chili-Bees (TGI Fridays, Chili's, and Applebee's) would not/could not survive on a business model that included such low pricing. The fast-casual burger players that survive on the mystique of 1/3 pound quality burgers, would not abandon their successful position by lowering prices/margins and adding cost to their model with full table service and increased food costs. This left the everyday-affordable casual dining position open to Steak 'n Shake, as long as the numbers could work in their favor by stealing sales from casual dining, fast casual and fast food categories. To make the math work, two things had to happen. First, commodity costs would need to be lower. Second, transactions would have to increase significantly, because even though the improved commodity costs would be helpful, "4 Meals Under $4" would likely decrease the average check substantially. The plan worked. With a baseline offering of "4 Meals Under $4" including versions of their famous Steakburger or chicken fingers and fries starting at $3.99 every day, transactions steadily grew to an amazing 20% increase by the fourth quarter of 2009. They also attained an equally impressive 10% increase in same-store sales. Steak 'n Shake has continued this positive streak to date with 27 quarters of same-store sales and traffic growth. Del Taco had emerged from bankruptcy in the early 90's and employed a "market follower" strategy, happy to ride the coattails of the giant market leader Taco Bell. Often, whatever Taco Bell sold, Del Taco would follow by selling a similar item for a slightly less within just weeks. This strategy worked well with their limited budget as they exited bankruptcy, posting sales gains each consecutive year thereafter. However, by the time 1999 rolled around the magic of that strategy had worn thin. Del Taco was headed for negative territory with no compelling/differentiating story to tell consumers to steal them away from the 800 pound category gorilla Taco Bell, let alone fast food category leaders such as McDonald's or Burger King. In 1999, BrandTrip Partners CEO Tim Hackbardt joined Del Taco to head up their marketing department and work with the management team to get the brand back on the winning track. Recognizing that the "market follower" strategy had run it's course, Hackbardt and team dove into the brand to discover if any valuable differences existed between these two restaurant concepts headquartered literally just a few miles away from each other in Southern California. A simple notepad tally quickly revealed a variety of key brand pillars that spoke to the emerging consumer value for fresh ingredients. Additionally revealed was a solid list of well-performing products already on the menu that did not exist at Taco Bell. It was enough ammunition to begin to tell a solid story of brand differentiation. The trick would be how to tell the story. How to leverage those brand differences to make the message memorable and clearly define why Del Taco was different and better than Taco Bell. The answer came quickly during the next drive up the 405 freeway. As Hackbardt rode past the Taco Bell headquarters, he saw the perfect backdrop to shoot a series of compare and contrast "David vs. Goliath" commercials for a hard hitting challenger brand campaign. What better set could he hope for than a monolithic tower of cold corporate glass and steel with the Taco Bell sign mounted atop it for his convenience. No post production after effects graphic work required. In 1999, Taco Bell did virtually nothing fresh. Shredded cheese came in a bag, pre-cooked chicken came in a bag, pre-cooked steak came in a bag, dehydrated beans received hot water to make them beans again. All this was part of the much celebrated "K Minus" program rolled out years before, to decrease kitchen labor costs and improve consistency. "K Minus" was modern day big-brand food engineering at its finest. This would be the weakness of the Taco Bell "Goliath" brand that would be attacked over and over again by the much smaller Del Taco "David" brand. Additionally, Del Taco would regularly feature signature menu items that could not be found at Taco Bell. Chicken grilled fresh every hour. Slow cooked beans made from scratch for 2.5 hours. Aged 40 pound blocks of cheddar used to freshly shred cheese throughout the day. Salsa made fresh every day. Steak grilled fresh every hour. To complete the "David vs. Goliath" storyline, the advertising agency developed a Del Taco spokesperson named "Dan From Del Taco." Dan was the "everyman" character. A little guy trying his best to compete against the big corporate giant. The underdog you can't help rooting for. The results were immediate and changed the perception of the brand. Without any additional media spend, the creative and messaging alone drove the brand from being a small regional player to advertising awareness levels equal to the national competitors. Del Taco brand awareness rose an amazing 100%. Sales improved as well, driven primarily by transactions, but also increased average check as the brand now had grown the credibility to offer more expensive quality based menu items. During the time that Hackbardt and team led the brand with this strategy, Del Taco enjoyed breaking all historical sales, transactions, average check, and profit records. Every month featured positive same-store sales for 44 consecutive months and average unit volumes increased 33% or $330,000 to $1,200,000. If your brand is stuck in a slow (or fast) death spiral, re-positioning your brand might be a serious consideration. Here are a few questions you might want to ask yourself as you take a good, long, honest look at the brand in the mirror. Results Today - Does your brand truly have a unique and compelling slot in the mind of the consumer obtaining the results your company desires today? Results Tomorrow - Does your brand truly have a unique and compelling slot in the mind of the consumer that will secure the results your company desires tomorrow? Potential Better Position - If it doesn't, is there a space available that is not claimed by another brand that can drive those desired results, or even better? Level of Change - How much will you need to adjust/change your brand to claim that space? Resources - Do you have the resources, or can you get the resources, that are needed to claim that space in the mind of the consumer? Support - Will your team/company do what it takes to claim this space? Competitive Claim - If you don't claim the space, will a competitor or emerging competitor claim it and how will that impact your business? Non-Claim Results - If you don't claim the space, what will be the short and long term results for your brand? Employee Plan B - If those "Non-Claim Results" were predicted to be negative, is your resume and LInkedIn profile up to date and optimized? Ownership Plan B - If those "Non-Claim Results" were predicted to be negative, have you consulted with a bankruptcy firm in recent months or brokerage advisor to sell your company? We have certainly developed many successful beverages in our day here at BrandTrip Partners for our clients. This time the accolades are in Saudi Arabia. With temperatures exceeding 120 degrees during the summer, there is a lot of thirst to quench in this country. The local lifestyle magazine, Destination Riyadh, reviewed the new Turnstone Pizza brand we created for our client in Saudi Arabia and had this to say about the specialty beverage menu. "We have recently discovered Peach Bellinis at Turnstone Pizza where they also serve a mean Strawberry Italian Soda. It's the drink of the summer!" As an expert on restaurant turnarounds, QSR Magazine reached out to our CEO Tim Hackbardt to provide insights on the positive momentum at KFC. He comments on everything from Rob Lowe in a space suit to their historical struggle to have success at selling chicken sandwiches. It is a rare day when a client comes to you with a "blue sky" project. That is what happened when a large foodservice company in the Middle East engaged us to develop a new pizza brand from a blank page. As they looked at entering the crowded pizza category, they could not find a franchise model that they felt had a strong position in an under-served consumer space. That's when they called BrandTrip Partners. We took them through the discovery process that included reviewing the history of pizza, pizza types, the current set of competitive brands on the positioning ladder, performance of the category, national/international research and trends, and a four-city tour in the United States to sample different styles of pizza and see the latest emerging and established brands in person. Following the discovery phase, we delivered our recommended strategic direction for the new brand and how it could easily scale into a multi-national enterprise through a combination of company-owned and franchise driven expansion. Turnstone Pizza would be positioned above the national chains with a Neo-Neapolitan style pizza dough made with Italian milled flour, pizza sauce made with San Marzano tomatoes grown at the foot of Mount Vesuvius, and other imported quality ingredients baked in a unique Italian stone oven. Enhancing the experience, and the average check size, the brand would feature culinary forward "companion" menu items such as stone baked house-made meatballs, Italian olive medley, Italian butter beans, house-made dessert Calzones, and house-made Skillet Sweetbread. Additionally, a signature beverage platform would be designed to further round out the experience and define the brand well beyond the typical commodity soda menu offered by the national chains. The brand would be defendable against competitive actions by the national chains given the fact that the majority of our menu could not be duplicated by them since their ovens cannot produce a similar product. Due to the menu strategy, and consumer value for higher quality menu items, the brand would feature a higher check average than the national chains. This higher check average, combined with an extremely low back-of-the-house build out cost at or below the national chains, will deliver an attractive return on investment encouraging rapid unit expansion. To further maximize sales, the revenue model would include dine-in, carry-out, catering, and delivery. Delivery would be a key factor in the success of the brand and driven by call center, online ordering, and mobile app purchasing channels. The strategy received the green light and we proceeded into the development phase. This stage brought the brand to life with brand identity, brand story, business model optimization, kitchen design, equipment sourcing, interior/exterior design, culinary development, product sourcing, training materials, packaging design, menu design, marketing technology stack, and the list goes on. 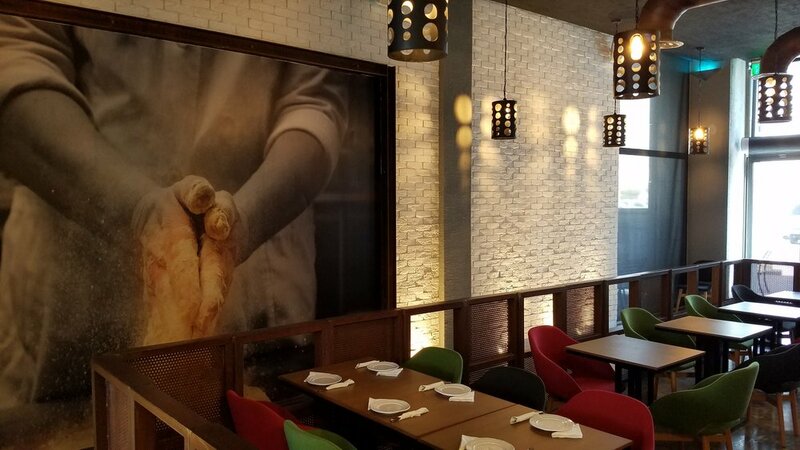 The final stage included the BrandTrip team arriving onsite in the Middle East to work with the staff to train and open the first Turnstone Pizza restaurant. 2017 has delivered more of the same tough times to restaurant chains as were likewise bestowed upon them in the second half of 2016. The store closures have accelerated to a level not seen since The Great Recession in 2009, the C-suite continues the revolving door and shuffling of chairs, and the negative same store sales trend has not discriminated against any category. Additionally, activist investors are swooping in to feed on the bones of public companies in the midst of the chaos as well as private equity firms bottom feeding for deals. BrandTrip Partners has been publishing a series of articles on turnaround strategies for restaurant chains to provide inspiration, and opportunities, that can calm the seas at restaurant brands in need of a new navigational heading. The first article, "How To Turn Restaurants Around - Exponential Leaps Through New Revenue Channels," provided insights on how to look outside your current business model and find new sales streams. Successful new revenue channels are able to grow the value of your brand with exponentially accelerated results, significantly improving the overall valuation of your enterprise with long-term sustainable growth. Our second article, "How To Turn Restaurants Around - Throughput Acceleration," explored the powerful advantages of attaining more transactional behavior in a given amount of time. The innovation tends to be accomplished through technology enhancements, process improvements, or physical plant alterations. This third edition will cover the opportunity to expand your revenue through adding sales in a daypart that you currently do not offer, do not normally excel in, or believe you can gain significant share in well beyond your current volume. However, it is important to point out this strategy can have substantial risk and winning is less than guaranteed. We will not only share successes but also some failures by major restaurant chains in their efforts to achieve Daypart Expansion enlightenment and prosperity. For those who don't live in a Jack In The Box market, this brand has held a strong position in the consideration set for late night drive-thru dashboard dining for well over thirty years. Those getting off of second shift, students studying late, and partying/questionably under the influence grazers hungry to re-balance their chemical state have supported the cause ordering burgers, fries, shakes and their infamous "greazy" deep fried Jack In The Box tacos. Late at night there is truly nothing that hits the spot better than the Jack in The Box deep fried taco. The shell, and meatish paste like filling, is pre-frozen and together deep fried upon receiving an order. It is then garnished with shredded lettuce and a slice of American cheese before being inserted into a comfortable paper sleeve for your heart-stopping pleasure. However, with the ever important need of additional sales, strong competitors such as Carl's Jr., McDonald's and Taco Bell began to rapidly expand locations that were open 24 hours in the heart of Jack In The Box core Western U.S.A. markets. The result for Jack In The Box was a gradual erosion of sales that mounted up to something significant in an industry that can define winners, and losers, by only a few percentage points of same store sales performance. Few competitors, other than Taco Bell, put little more marketing behind their extended hours other than signs in the windows. Jack In The Box decided to double down to regain their lost footing in the late night zone with not only a well-targeted marketing campaign, but also a smart product strategy. Although the company will not publicly admit it, the launch also coincided with the Colorado Amendment 64 which legalized recreational marijuana use in the state in 2014. Jack In The Box clearly spoke to this consumer with their creative and their product strategy. Television commercials featured storylines of half-baked youth interacting with a mind altered puppet version of their famous spokesperson CEO/clown Jack. The product strategy similarly featured a set of boxed "Munchie Meals" that were smartly only available after 9:00 p.m.. The messaging was supported across all marketing elements with the tagline "The Party Starts At 9PM" including execution at the restaurants with staff wearing special t-shirts and even music playing in the drive-thru lanes to change the environment/experience. Notice also that the price of the Munchie Meals is $6.00 which is greater than their average guest check. When in the mood for munchies, the bet was that price was less of a deterrent that satisfying the need. Through the haze, the stoners took notice and drove positive same store sales for the brand. Previous to instituting this strategy, Jack In The Box was in a downward spiral for same store sales. As you can see below, this was the start of an impressive turnaround for the brand noting that the program began in late September of 2013. Investors got a contact high from the performance of the strategy and subsequently drove the stock price up over 100% by the end of 2014. Interestingly, with all this success, no other brand came out to challenge them and take a piece of this clearly valuable market. There is a risk you take when embarking on tapping into the Daypart Expansion strategy. Jack In The Box had at least a reputation for being open late/24 hours. Thus, if they decided to expand their marketing focus into that daypart, there was some credibility. However, if your brand decides to have the doors open for the first time during a particular daypart, it can be much more difficult to convince your audience you are a believable provider that deserves their dollar. The breakfast daypart has taught this valuable lesson to more than one restaurant chain over the years. Wendy's tried it in 1986 and failed miserably (Read: How Wendy's Botched Breakfast LA Times October 5th, 1986) vowing to never go down that path again because of the memorable pain it left throughout the franchise organization. How could it have gone wrong? McDonald's was a burger place successfully selling breakfast, so why not Wendy's? They even had a television commercial with singing eggs! Even with the Madison Avenue singing egg creative that likely won an award for stop motion animation, founder Dave Thomas pulled the plug and called it a "mistake." Never say never in the restaurant industry. Wendy's once again threatened to roll breakfast out in 2013 only to cancel that plan and retreat to their happy place filled with square shaped burgers, baked potatoes, and dairy treats. Taco Bell also received a fatal blow to the bottom line with breakfast in the early 1990's. The idea was simple. They would take their extremely successful value menu strategy of 59, 79 and 99 cent items that were producing 10% to 15% same store sales increases annually and apply it to breakfast. However, the consumer did not view the quasi-Mexican concept Taco Bell as a place they would go for breakfast. Salsa had not become more popular than ketchup yet. Back then it was still a meat and potatoes kind of world. The lackluster sales and low prices never produced enough volume to cover the additional labor and extra expenses required to open earlier. Plus, they diverted so much of the marketing budget to the breakfast campaign, they had to cut back media to promote their bread and butter lunch daypart. That decrease in focus hurt their overall sales as their competitors' share of voice stole Taco Bell's lunch money. Fast forward 20 years later to March 27th, 2014. Most of the United States has eaten a breakfast burrito at some point. McDonald's has a breakfast burrito on their menu along with packets of salsa they will gladly hand you out the drive-thru window. The scary idea of Mexican fare for breakfast no longer exists. Taco Bell is also considered less of a Mexican brand at this stage in their history, serving a wide variety of quasi-Mexican and gimmicky handheld concoctions of all shapes, colors, and fillings. Use of the breakfast daypart has also increased substantially by consumers so there is plenty of share to be had if you get up early enough to take it. The results were substantial. They immediately turned around a negative same store sales pattern to lead the major fast food chains in growth. They had the credibility, they were able to take advantage of the upswing trend in consumer away-from-home breakfast, and they had the marketing muscle to drive it without losing share of voice supporting their core dayparts. A few years ago, Starbucks rolled out "Starbucks Evenings." BrandTrip Partners was asked by an adult beverage firm to check out the program as they were thinking of bringing us in with them to help Starbucks with the program. Since it was likely that a glass of wine was in our future the next few evenings, we shifted our venues of choice to the local Starbucks locations that had been offering the program for beyond a year so we could see if adoption had taken place. Over the course of our sipping and observing, we predicted that this program would likely fail. During each visit, we were the only people drinking wine or beer. Concurrent discussions with Starbucks managers confirmed that adult beverage product mix was low. The food portion of the program seemed to have a little merit, but the adult beverages were not selling enough to warrant the cost of the permits, storage, menu space, training costs, glassware, etc..
What was clear was the fact that consumers come to Starbucks to get caffeine. Students studying, small club meetings, frazzled locals sharing their woes with supporting friends, and wary online dating first-time meetings in a bright public place all required them to be alert and engaged. Adult beverages were contrary to the drug of choice for getting the job done. Coffee, coffee, and more coffee was why they were there. As you could imagine, after reviewing our report, the adult beverage firm did not invite us along for the presentation. Starbucks evenings died a slow death, and it was announced earlier this year the plug on beer and wine at the caffeine filling station had been pulled. In 2006, Panera attempted to break into the dinner daypart with a special pizza that was only offered in the evenings. If successful, the strategy would drive sales with a higher average guest check and any new transactions in the dinner daypart would be all incremental since traffic was typically extremely low due to their heavily sandwich based menu. The Crispani pizza featured a selection of six recipes including Tomato & Fresh Basil, Pepperoni, Roasted Wild Mushroom, Sweet Sausage & Apple, Peppered Chicken & Rosemary, and Three Cheese. It was made with fresh dough, brushed with olive oil and baked in special Panera stone deck ovens creating a thin, crisp crust. The marketing spin included in their press release was as follows: "Panera's foundation is in artisan bread, so it was a natural fit for us to create a pizza that is distinguished by its fresh-baked, handcrafted crust and enhanced by select, high-quality fresh toppings," said Dan Kish, director of product development for Panera Bread and former dean of the Culinary Institute of America. Unfortunately, consumers who are interested in having pizza for dinner usually go to a pizza place or order it for delivery to their house. They don't go to a sandwich place. The program was discontinued a year and a half later with this quote from their CEO: "As with everything, we took great learning from the failure of this product," he said. "We know that despite a great product, we simply did not have the marketing muscle or the staying power to engage the customer such that they saw Panera as a place for pizza." Size of The Prize - Is there a large enough market to warrant the multi-departmental investment of time? Brand Cred - Will the target market be convinced that your brand has the credibility to deliver in that daypart? Can it fit with/enhance your brand story and positioning? Marketing Power - Do you have the marketing resources to drive trial and repeat business? Just opening the doors and hoping guests will find you is usually a sure failure. Daypart Expansion needs care and nurturing over time, but the C-suite in our industry tends to have little patience for that. Results will be required early to convince management that the exercise has merit to continue to feed it with resources. Development Resources - Does your brand have the internal resources that have the time/experience to develop the plan or do you need temporary outside professional help to drive the program forward while everyone continues to keep focused on their day jobs? Supply Chain - Can you deliver a sustainable supply of product needed to execute the new Daypart Expansion? Financial - What is the outcome needed to cover the costs of supporting the program? Daypart Expansion efforts often have new costs associated with them such as increased labor, utilities, equipment, permits, signage, insurance, etc.. Execution - Will your brand be able to execute a Daypart Expansion? Will the various departments in your organization support the program, or are they non-believers out to make a point? If you have franchisees, will they participate? Sustainability - Can your brand sustain support for the Daypart Expansion? Or, is it something that will become invisible once a new shiny object is presented in front of your management team? Today, the BrandTrip team left for Riyadh, Saudi Arabia to unveil a new brand that has been a year and a half in the making. A truly "blue-sky" project, our client Olayan simply asked us to develop for them a pizza brand that they could scale throughout the Middle East and possibly the world. The result is Turnstone Pizza that fulfills a large void in the marketplace and features a multi-revenue channel business model with a low build-out investment. Turnstone Pizza will be the first wholly owned brand by Olayan. They are a current international franchisee of Burger King, Church's Chicken (Branded Texas Chicken in the Middle East), and Buffalo Wild Wings. Ahead of us is a 19.5 hour flight on a single plane. It is the fifth longest flight in the world! We liken it to space travel! Join BrandTrip Partners CEO Tim Hackbardt in his efforts to support the Challenged Athletes Foundation as he takes on his own challenge to complete his first Ironman race. "Each year I set a big goal to break down personal barriers and help an organization do some good. Then I commit to it and figure out how to get there," said Hackbardt. "Last year it was all about climbing 10 of the most famous mountains of the Tour de France even though I hadn't owned a road bike in over 20 years. [Click here to view his 2016 Climbing France For CAF blog] After training for six months, riding 3,353 miles, and climbing 313,207 feet I arrived in France. I rode all 10 mountains completing 430 miles, and 64,313 feet of climbing, in eight days. I also raised over $4,600 for Challenged Athletes Foundation. I came up short on my goal of raising $10,000 for CAF, but a lot of good was accomplished with what were able to donate to their cause. So, in 2017, what do you do to top riding 10 of the most famous mountains of the Tour de France? Become an Ironman of course. What barrier will we he overcoming? At age 52 he does not know how to swim. An important skill when you need to start the day with a 1.2 mile swim in a pack of a few hundred people in wetsuits and bright swim caps flailing their arms and legs in a large body of water. He is betting that his fear, and anxiety, of drowning will turn into determination to avoid that negative outcome called death. That being said, the decision has been made and money has been invested in an entry fee. At his own cost he will attempt to swim 1.2 miles, cycle 56 miles, and run 13.1 miles on October 29th, 2017 in Austin, Texas at the 70.3 Ironman Austin. Unfortunately, last year he did not reach his goal of raising $10,000 for Challenged Athletes Foundation. he came up short. Since CAF was originally founded by the triathlon community, they are the natural choice and they continue to have more grant requests from their athletes than they have money to fulfill those requests. Thus, he has reset the start button at a goal of raising $10,000 through his new 2017 Ironman Austin challenge. CAF athletes face even greater challenges overcoming physical disabilities and being able to afford the cost of equipment such as sports wheelchairs, handcycles, mono skis and sports prosthetics, and resources for training and competition expenses. Please join Tim in making a donation towards the $10,000 fundraising goal. You will provide individuals with physical challenges with the tools necessary to find success in sports — and in life. 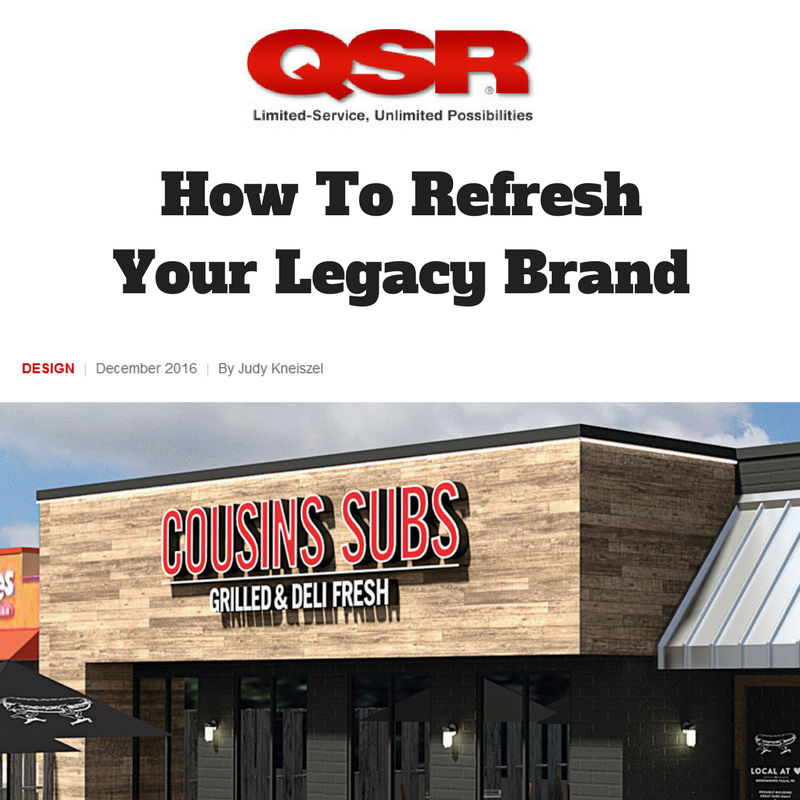 As an expert on restaurant turnarounds, QSR Magazine asked our CEO Tim Hackbardt to share his experience on how to execute a successful brand refresh. The past few months of 2016 have delivered even more gloomy news for restaurant chains. The store closures continue to mount, a new crop of bankruptcies have been filed, the C-suite is rotating like a centrifuge, and same store sales declines are affecting all categories including the industry darling fast casual segment. To help navigate these stormy waters, BrandTrip Partners is publishing a series of articles exploring turn around strategies for restaurant chains. The first article, “How To Turn Restaurants Around – Exponential Leaps Through New Revenue Channels,” provided insights on how to look outside your current business model to find new sales streams. Successful new revenue channels are able to grow the value of your brand with exponentially accelerated results, significantly improving the overall valuation of your enterprise with long term sustainable growth. In this second installment we will examine strategies to improve throughput. “Throughput Acceleration” simply allows the movement of more transactional behavior in a given amount of time. The innovation tends to be accomplished through technology enhancements, process improvements, or physical plant alterations. In their most successful implementations, Throughput Acceleration can be as highly impactful as the double-digit exponential leaps found through new revenue channels explored in our previous article. A more typical result drives solid single digit results. Everyone is aware of the amazing growth story of Starbucks. However, just before The Great Recession, they slowed down substantially in the United States with negative sales and transactions in addition to store closures. Their stock naturally reacted with a huge dive. To make matters worse, there was a little company called McDonald’s that overnight opened their McCafe platform in approximately 14,000 locations throughout the United States instantly becoming the largest provider of lattes in the country. If you look at history with McDonald’s, they do well when they identify a major trend and offer a decent product at a lower price delivered more conveniently. McCafe was the text book example. A critical component of the McCafe platform that stole market share from Starbucks was the drive-thru. Back then, you were required to wait in that painfully long slow line at most Starbucks locations. However, at McDonald’s you didn’t even have to get out of your car. “Drive-thrus create incremental revenues and profits compared to traditional stores and represent a fast-growing and highly profitable format for Starbucks, comprising just over one-third of our U.S. company-operated stores but contributing nearly 45 percent of our U.S. retail profit,” Schultz said. With these kinds of numbers, Starbucks could simply use this single tactic to continue to scale substantial positive volume and profits for years to come as long as the real estate sites allowed it. In recent months, many other chains have announced joining the drive-thru club. Friendly’s reported that they can generate more than 25% in additional sales when they have a location that includes a drive-thru. They are simply leveraging the physical plant to serve more guests. There really is no better technology driven Throughput Acceleration example than what Domino's has done over the past few years with their “AnyWare” ordering obsession. They championed the virtually unlimited capacity to take online orders so much that they even produced advertising telling customers not to call them anymore to place orders. Domino's literally admitted they are bad at taking orders, thus offsetting their labor costs to strictly a production and delivery force in the restaurants. Additionally, their relentless focus on attaining as close to a zero click transaction as possible is keeping them ahead of their competitors and crushing the independent pizza players. They are mastering ordering opportunities across everything from the mobile app to message bots delivering the ability to order their products with whatever communication device you may be near. Ordering pain points have almost vanished for Domino's customers. This Throughput Acceleration technology innovation has produced 22 consecutive quarters of same store sales increases and has raised the value of their stock over 500% in the past 5 years! It wasn't because of a new pizza, a discounted "2 Fer" deal, or a movie release tie-in. The primary innovation was Throughput Acceleration through ordering technology supremacy. How beautiful is the Panera 2.0 dine-in platform? You walk in, sit down at any table you want, order on your phone, input the table number, send the order, and food magically appears at your table moments later. No standing in line. Isn’t that what we all want? Isn’t this how life should be? We are shocked that no other significant quick service or fast casual brands have done this yet! Hello restaurant industry! It’s almost 2017! Do this and you achieve nearly 100% order accuracy, 100% happy guests, 100% the correct change, 100% etc. The technology exists. Why should I stand in that line at Shake Shack, IN-N-OUT, or any other restaurant line? There is absolutely no reason for this pain point to exist anymore at any restaurant chain. Just bring me what I want to where I am, already pre-paid. This is, of course, is not to mention that this same technology at Panera Bread allows for take-out orders and delivery orders too. You can also otherwise skip the line and use a kiosk ordering tablet. In other words, Blaine is lovin’ his transaction drivn’ and sales climin’ Throughput Acceleration platform. In 2014, BrandTrip Partners CEO Tim Hackbardt was part of the team at BJ’s Restaurants that launched the first casual dining restaurant chain mobile app and online ordering platform that allowed you to order your meal for a dine-in occasion. The cumbersome process of placing your order and paying for it in a sit-down environment can be fraught with a long list of pain points depending on how efficient your staff is during that shift. The BJ's team focused on those irritations and applied the appropriate pressure to the age old casual dining ordering and payment wounds. The new process allows you to place the order on your phone, show up (all mobile orders automatically get you placed on the preferred seating waitlist by the way), get seated and the food starts coming right out. More importantly, when you want to leave, press a button on the mobile app and your bill is paid. Done and done. Note: The fact that the CEO of BJ’s was also a board member at Domino’s should not be lost in this conversation. No longer did you ask the server for the bill, wait for the server to come back, wait for the server to come back to get the credit card and bill, and wait for the server to finally bring back the credit card and bill for you to sign. That entire exchange was eliminated, providing a more pleasant check out experience for the guest and faster table turns that results in more sales volume and also more tips for the servers at the end of the night. Fast forward now to almost 2017 and still no other casual dining chain has introduced that speed or convenience for their dine-in guests. Like Starbucks, Johnny Rockets was interested in adding on those double digit drive-thru sales. However, since the inception of the brand they had been flipping burgers the old fashioned way on the classic flat top grill. This equipment was not conducive to the expectations of a customer that the drive-thru is the high speed lane to getting fed. They needed to evolve their physical plant to take advantage of the expansion opportunities they wanted for the brand both domestically and internationally. The answer was blowing up the kitchen. The new high efficiency kitchen now features a clamshell style grill that reduces the cooking time down to only one minute. They also made changes to be able to make shakes faster and other process improvements. The brand can now grow around the world with many more real estate opportunities than ever before and achieve higher revenues than the previous business model, thanks to their new Throughput Acceleration based kitchen design. Much of restaurant history is littered with successful Throughput Acceleration milestones that took market share away from competitors or launched new categories and brands. Fast food, fast casual, Domino's 30 minute delivery guarantee, the drive-thru, and online ordering are just a few examples that have delivered substantial financial rewards for these type of improvements. Less well known are the countless programs behind the doors of restaurant chains that have simplified operations shaving seconds, and sometimes minutes, off of cook/preparation times to drive more transactions. Fast food knows that just a few more cars through the drive-thru can result in significant sales comps. Casual dining knows that table turns do the same. By focusing on the opportunity to achieve more transactional throughput by leveraging technology enhancements, process improvements, or physical plant alterations you too could easily exceed the industry average and set your brand up for many years of success. On November 5th, friends of BrandTrip Partners gathered at BK Cellars Urban Winery in Escondido, California for an evening featuring red wine and red attire. The highlight of the evening was a blind wine tasting contest. Participants tasted four red wine pairings from masked bottles, read descriptions of each wine in the pairing and then were required to guess which wine was which. The person who matched the most wines correct would receive a full case of any BK Cellars wine to take home while second place could choose three and third place was able to select one. No entrant into the contest guessed all correctly, but four guests did guess six out of eight wines. To break the tie, the guessing game continued with a challenge to determine how many M&M’s were in a sealed jar. Congratulations to Sharon Simmonds from Horizon Food Group as she was the most skilled oenophile and M&M guesser of the evening. She took home a full case of BK Cellars wine of her choice. Jeff Schroeder, of Jack In The Box and Coffee Bean & Tea fame, got particularly lucky as he placed second and his wife Ruth placed third netting them four bottles of the limited production vino. Sharon Simmonds from Horizon Food Group wins the blind wine tasting and takes home a full case of BK Cellars wine. Jeff Schroeder of Jack In The Box and Coffee Bean & Tea fame take home four bottles of BK Cellars wine as they collectively placed second and third. Restaurant mobile solutions leader SplickIt recently acquired Onosys to provide multi-unit restaurants access to a proven mobile and online ordering system, integrated loyalty and catering programs, and technology support from one single company. To fully showcase their new platform, and new marketing automation capabilities, they invited restaurant brands from around the country to join them at their offices in Boulder, Colorado on November 3rd. Given our extensive experience in this area, BrandTrip Partners CEO, Tim Hackbardt, was asked to provide the group deep insights into how mobile restaurant technology has evolved and what the future has in store for our industry. BrandTrip Partners has been a leader in the restaurant industry consulting with chains to help them develop their future technology strategic roadmaps that include integrated mobile platforms, new media strategies, loyalty programs and connected CRM/Big Data systems.